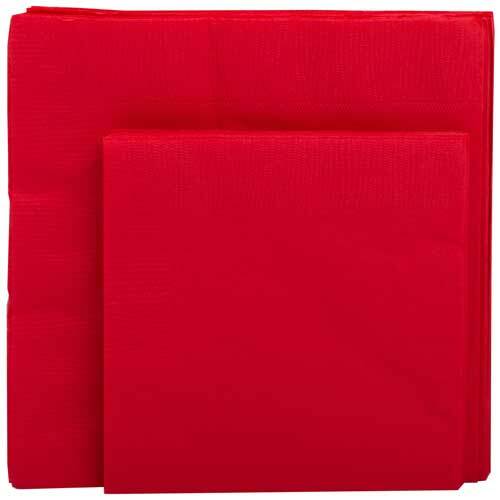 Clean up in style with these sleek red napkins. Complete your Christmas, Valentine’s day or any other red-themed party with our wide selection of red tableware. Probably the most important to any crazy Christmas bash are the napkins since there will either be a lot of spills happening or a lot of messy, couldn't wait to eat because it is Christmas family members. And Valentine's Day parties? Well napkins are definitely needed for the crying that will happen from your single friend that couldn't get a date in time. Without napkins, no mess would be cleaned up! Red Paper Napkins come in sets of 16 or 50 to a pack. Paired great with any of our other red tableware such as plates, cups and table covers, no theme is complete without a classy set of napkins. If red is the color you’re looking for then search no further. These paper napkins are stable and reliable. They are available in three different sizes: Small Beverage Napkin 5 x 5, Medium Lunch Napkin 6.5 x 6.5, and Large Rectangular Guest Napkin 8 x 4.5.